For the first 20 years of life I had an all-too-common notion about bats--that they were scary, somewhat dangerous animals. That began to change when I learned some truths about bats in a mammalogy course at Cornell University. This happens so often in life--fear disappears as knowledge and understanding grow. The change accelerated when I wrote Vampire Bats (Morrow, 1982). Vampire bats sometimes take blood meals from people--YUCK! However, I learned about many facets of the lives of vampire bats from researchers who knew them well. I learned about their intelligence, their close social bonds, their caring for injured or orphaned colony members--all qualities that we admire in other, more appealing mammal species. I grew to admire and appreciate them, and ended that book with these words: "The vampire bat, after all, is not a mythical monster. It is a fascinating real creature that happens to need blood in order to fly, to raise its young, to live." Next I wrote about a remarkable man, Merlin Tuttle, in Batman (Atheneum, 1991)--his life, research, and efforts to change public attitudes about bats. Tuttle founded Bat Conservation International, an organization that aims to aid in the conservation of one of the least popular groups of animals on Earth. It has made remarkable progress. Perhaps, in a small way, my Batman book has helped. However, it was not needed at the Chautauqua Institution in western New York--a cultural oasis and one of the most bat-friendly communities on Earth. At Chautauqua I met bat researchers, as well as numerous bats, and decided to write Bats! Strange and Wonderful. My aim was to write an introductory book--one that could be read to a young child--that also had enough fascinating details and illustrations to intrigue older readers who were curious about bats. For many summers my family and I have enjoyed seeing a few bats overhead hunting insects in the twilight. One fall I asked for a birthday gift of a bat house. I assembled it, painted it black, and put it on the side of the house that catches the most sun. This makes a warm, cozy resting place for bats. Once or twice each summer I climb a ladder to the site and shine a flashlight up into the house. Usually there are one or two little brown bats, Myotis lucifugus, huddled at the top of the warm shelter. I quickly leave, not out of fear, but out of respect. Bats have been good, insect-catching neighors to me, and I aim to be a good neighbor to them. "There were two dark brown things in the toilet water. They were not the usual dark brown things you see in toilets. They had wings. They were bats, and they were swimming. They were doing the bat stroke." below, and also find more by typing "white-nose syndrome" into an internet search. About 1975, bats were one of the least popular group of animals on Earth. Since then many people have learned that bats are "gentle friends, essential allies," as they are described in a booklet of Bat Conservation International. This organization has played a major role in changing public opinion about bats. Even the most enthusiastic advocates of bats warn people: do not touch them. In some areas a small number of bats may carry the disease rabies. Worldwide, 99 percent of all people who die of rabies get it from dog bites, not bats. Still, avoid touching any bat, alive or dead. Admire bats from a distance--for their well-being and your own. Many nature centers and science museums, as well as some state and national parks, offer field trips, workshops, and other programs about bats. If you are fortunate to have bats in your neighborhood, you can watch them hunt flying insects in the twilight. Books that can help identify bats include the paperbacks Bats of the World, by Gary Graham (Golden Press, 2001), and Beginner's Guide to Bats, by Kim Williams, Rob Mies, and Donald & Lillian Stokes (Little, Brown, 2002). You may want to buy or build a shelter in which bats can rest in the daytime. Whether a bat house attracts bats depends on its design, color, and location. Bat Conservation International is a good source of information on bat houses. 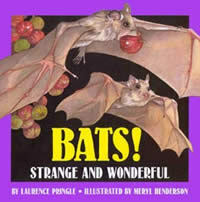 It also has up-to-date information on bat conservation, and threats to their survival. Like all kinds of wildlife, bat populations are harmed when their habitat--including safe roosting sites--are destroyed. Migrating bats also may be killed by the fast-moving blades of giant turbines of wind farms. By far the greatest threat to bats in parts of North America is a disease called white-nose syndrome. Between 2006 and 2015, this fungal disease caused the death of nearly six million cave-dwelling bats in twenty three states and five Canadian provinces. Steps have been taken to keep cave explorers from accidentally spreading the fungus, and scientists are learning more about the disease in order to help bat populations rebound. Since bats reproduce slowly, this will take many years.